I decided to participate in Chuck Wendig‘s flash fiction challenge this week. The idea was to use a random number generator and match the numbers to lists of words, resulting in a two- or three-word title, which I would then use to write a piece of flash fiction no longer than a thousand words. Confession time: I cheated. The first title I rolled was Bloody Murders. I’m not writing about that crap. My re-roll yielded Diamond Promise. I changed it to Diamond’s Promise, because, well, I wanted to. “Yes. You promised Mom you would.” Carson glares at me from the passenger seat. “Why would you think that?” He uses his hands to demonstrate how to release the clutch while applying the accelerator. I try his technique and stall the car after it scoots forward with short screeches. “If you’re gonna laugh at me every time it stalls, I quit.” Facing my fear of driving is bad enough; being laughed at certainly isn’t helping matters. “Says who? Maybe I can take the bus.” Like the public transportation system in our city, the suggestion is a joke. “It just seems cruel.” Drops of water spatter on the windshield. I turn dials and click levers until I find the one that works the wipers. I know that. The rain had fallen onto the already-twisted metal. My anxiety catches in my throat, and I swallow. “Fine.” After another engine restart, I work the pedals and travel halfway across the parking lot. I panic at the added speed and hit the brakes, but I forget the clutch. Another stall. Another thunderclap. He laughs again, and I clench my jaw. I’d almost forgotten the striking contrast of his bright teeth against his brown skin. “They’re fine. You’re the only one still struggling. This won’t get easier unless you deal with it.” He yanks on his seat belt until it catches. “Just making sure it works.” He winks. He looks out the side window. I lift my left foot while lowering my right, and the car moves forward. I press the accelerator. Raindrops pelt the car as it travels, filling the cabin with loud, rapid beats. I hold my breath and make it to the edge of the lot before I press the brake and clutch, bringing the car to a surprisingly gentle stop. It idles in place. The rainfall stops, and the wipers scrape against the dry windshield. I turn them off. Adrenaline races through my body. I look at him, beaming. I close my eyes and sigh. When I open them again, I’m staring into my desk drawer. The key to his Sentra rests there, in the same place it’s been for the last year. I can’t use it because the car it matches is a compact, metal cube, I assume. 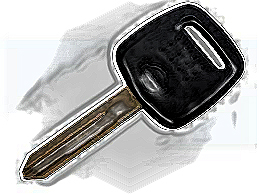 I pick up the key and run my finger across the cool, rough metal, remembering the one driving lesson I had with Carson. I didn’t make it across the lot without stalling that day. Like the visits with my brother, my driving success exists only in my imagination. I put the key back into the drawer and close it, leave my room, and find my mother sitting at the kitchen table. She’s holding a cup of coffee and staring out the glass door at the falling rain. I approach the crystal bowl on the kitchen counter and remove the key to her Camry. I look at it and swallow before I find the words I need. She faces me and grins her forced, sad grin. Love your writing, so succinct! What happened to Carson? I like this! I haven’t tried writing flash fiction yet but have read some very good stories as of late. Thanks for sharing on archive day! Thanks for reading, commenting, and following! I struggled to get into short stories for a little while. These flash fiction challenges motivate me.